Heroes Of The Storm Beta Key, Get Your Beta Key From Asiasoft - KABALYERO - PLAY, BLOG & EARN! Heroes Of The Storm Beta Key, guys, are you still looking for a beta key for Heroes Of The Storm? 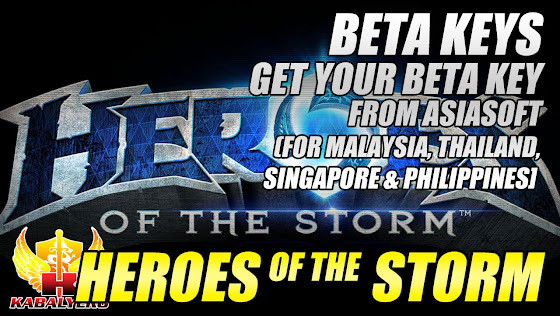 If you are in Malaysia, Singapore, Thailand and Philippines and you are still looking for a beta key for Heroes of the Storm then you'll be happy to know that Asiasoft is still giving them away. Just go to Asiasoft's Heroes Of The Storm Beta Key Redemption page, login to your Facebook account, fill up the form with the required information, click the Submit button and wait for your Heroes of the Storm beta key. Unfortunately, this Heroes of the Storm Beta Key Giveaway will only run for a limited time or until all keys are redeemed. It also does not guarantee that you will get a Beta key but there is definitely no harm in trying. Anyway, the link to Asiasoft's Heroes Of The Storm Beta Key Redemption page is in the description of the video below or click here.